Rock climbing is one of the most visually spectacular sports activities, with people hanging from cliffs with just a rope for support, and sometimes not even that. But for most of us, we’re not about to climb up the side of a mountain. The thought of a fall will keep most people near the ground, and without the proper skill, it is not safe to even think about participating in this sport. But that does not mean that a novice mountain climber or a person who is not a daredevil cannot get the fitness benefits and take in the enjoyment of rock climbing. A number of indoor rock climbing gyms have popped up over the years, giving a person the feel of climbing to new heights, without the fear of getting too far off of the ground. And seeing that the floors in these gyms are usually padded, the short fall won’t really hurt. 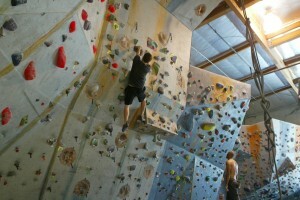 Most people get into indoor rock climbing as a form of exercise, as it is a full body, core workout. 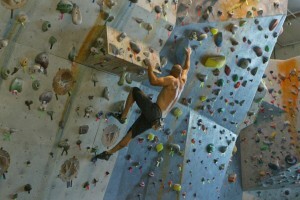 Climbing up the walls of these gyms puts a person’s body in unusual positions, and it requires the body to use a lot of strength to move from one notch to another. The core muscles are constantly engaged throughout every movement, upper body muscles are being utilized to pull the body up, and lower body muscles are used to push the body. While many people hit the gym, spending hours in the weights section, or on the treadmill, many adventure seekers are taking up a variety of activities to stay in shape, with indoor rock climbing being one of them. Bultsa said that he has seen people take up rock climbing and improve their fitness level, whether that be gaining strength or losing weight. This activity does not take any experience to get started, as indoor rock climbing gyms have classes that teaches the basics, so this is not just a sport for people who are already in great shape that are looking for the next thrill. “I’ve seen all type of people do this, so it’s not limited to a certain niche,” Bultsa said. One thing that Bultsa likes about this activity over working out at the gym is that it builds camaraderie with others because it is not an activity that people do alone. 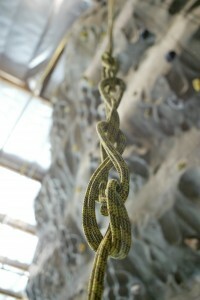 Indoor rock climbing gyms, such as Hanger 18, provides a safe environment for beginners, and it also allows people to push their bodies in ways that most workout programs do not. People gain a sense of accomplishment from this activity. Bultsa also gets outside and rock climbs on the real thing, which he likes because he enjoys the experience of being out in natural environments, but he sees how indoor rock climbing can be a lot more attractive. For people who are looking for a change of pace, or to conquer a new athletic endeavor, indoor rock climbing could be their next great adventure.